The 90-year old Don Muang Airport was supposed to be retired in October of 2006 when the new Suvarnabhumi International Airport was opened to replace it. However, over-crowding and technical problems forced the Airport Authority to re-open Don Muang for domestic traffic in March of 2007. 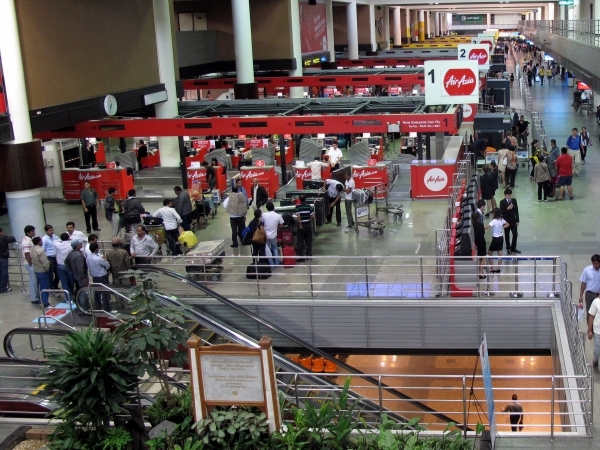 With over-crowding getting even worse, the airport was further refurbished to serve as Bangkok's primary airport for low cost carriers, for both domestic and international flights, and on 1 October 2012, budget behemoth Air Asia moved its entire operation back to the old airport. The terminal building is mainly on two levels. Arrivals and baggage claim are on the first floor; check-in and departures are on the second. There is a third floor about the check-in counters where you'll find a couple of restaurants, offices, and observation decks. For information about what to see and do in "the big mango" visit the Bangkok for Visitors Guide.